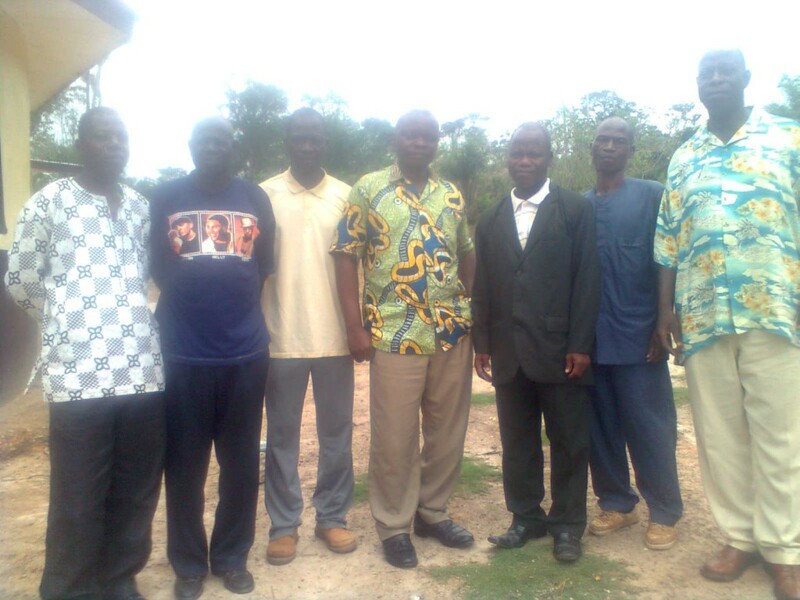 Local law enforcement near Nimba County in Liberia gathered for a JusticeMakers workshop about the rights of the accused living with HIV/AIDS. From left to right: 1) Police Commander a. Cyrus Marwon 2) Cllr. Gideon Tozay 3) Clerk of Debt Court Arthur Queyaker 4) Cllr. Cooper Gweh, Associate Magistrate 5) JusticeMakers C. Christian Zarweah 6) Staff at the City Council Hon.Stanley Bella, and 7) Attorney Julius Monluo. We send you warm greetings from Nimba County, rural Liberia. Greetings! March 9 marks a major milestone for the defence and rights of the affected persons in our region — a JusticeMakers organized workshop brought all the law enforcing agents of the region together. After more than six hours of driving and a breakdown that lasted for four hours because of bad road, I finally made it to Karnplay, the headquarters of the district where the workshop was scheduled. Interestingly, all the law enforcers invited to the workshop were all rushing to arrive on time. The workshop opened with brief introduction of IBJ’s mission to provide a conducive environment in which the rights of people affected by HIV/AIDS are respected and they receive a fair trial with people to defend them when they are accused of crimes. Our defence team agreed to offer their services even when the project life is over. Yes, indeed, this is a major breakthrough for affected people in the land, as the legal team is assigned to the three major courts of the region. Additionally, the Police, Magistrates, City Council and the District Attorney all agreed to collaborate in defending and protecting the affected ones. This is the first time in the region that all the key law enforcers have ever come together to confront a common issue. After the workshop, the magistrates, attorney, legal students, city council, and police commander all sat on a round discussion on strategies to improve the rights and protection of affected persons. The law enforcing agents agreed upon a declaration stating that any citizen abusing or discriminating against any affected persons would be prosecuted in the court of law. Additionally, everyone collectively agreed that medical workers at health centers and clinics who are in the habit of disclosing to the public the names of affected persons would now be brought to court if such news reaches any of the law enforcers. Christian Zarweah is a 2012 HIV/AIDS JusticeMaker fellow in Liberia. His project aims to train defense lawyers to ultimately help defend the accused who are living with HIV/AIDS. Read more about the 2012 IBJ JusticeMakers here.